Whilst I appreciate many may be unaware of the fact that those who give Immigration advice have to be regulated. In order to protect those who may well be in a very vulnerable position from being exploited rules are I’m place which ensure that Immigration advice is only given by those qualified to do so. i have been notified by the Office of the Immigration Services Commissioner that last month they successfully prosecuted a Mr Leonard Kachingwe for offering unregulated immigration advice in Bury. If anyone has heard of him operating, the Office of the Immigration Services Commissioner would like to know! If you come across him please contact me and or the OISC. I met with representatives of the Kashmir community yesterday to discuss the ongoing situation in Kashmir, particularly on the Indian side of the Line of Control which divides Kashmir. There were harrowing accounts of relatives killed by the bombs and children blinded by pellet guns. With the continuing tragedy in Syria Kashmir rarely gets a mention in the UK media as indeed as been the case over the decades. The human rights violations continue and as Chairman of the All Party Group I was grateful for all the additional information I was provided with. This is something which must be raised in Parliament. A big thank you to all those from Manchester University Conservative Future Group who came along last night and posed such a wide range of questions. Along with some ‘regulars’ there were some new ones that I had not come across before which is always interesting. I wonder if I am alone in being surprised that the England Football Manager on a reported £3 million a year was discussing (so soon after being appointed) how he could earn even more money. Strange World. 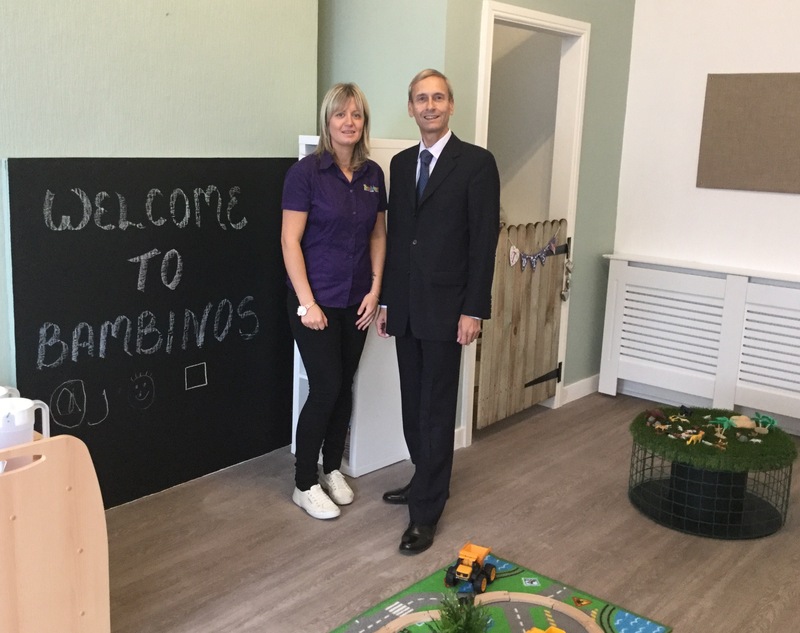 Many thanks to the owner Hayley Taggart and her staff for hosting my visit yesterday to Bambinos – Bury’s newest children’s nursery. It takes great courage and determination to take the leap towards setting up a new business from scratch. Finding premises, finding the capital, negotiating the regulatory jungle, finding staff – and that is all before the most critical task of all finding customers. With Bambinos Hayley has turned her dream of owning her own nursery into a reality. The premises have been refurbished and decorated to the highest standard. She has recruited qualified staff. Obtained all the necessary legal permits and approvals and is now open. Bambinos provides a superb environment for pre-school children to play and learn. Good news from the Football Stadia Improvement Fund that Ramsbottom United F.C. have been awarded a grant from them of £28,404 to help with the repairs and renovations following the terrible storm damage from Boxing Day last year. The Fund is financed by the Premier League and is the largest provider in the Country of grants which help prove the comfort and safety of lower league football grounds. The Football Foundation which delivers the Premier League and The FA Facilities Fund on behalf of the Premier League, the Football Association and the government via Sport England has also made grants to local clubs recently. Ramsbottom United Juniors FC has been awarded £10,000 to purchase new ground maintenance equipment and Walshaw Sports Club has been awarded £465 to help purchase new goalposts. So there we have it Mr Corbyn wins the leadership of the Labour Party for the second time in a year this time with an even bigger mandate than last time. By any assessment it has been a disaster for the moderates in the Labour Party. They have been pursuing a determined course with the aim of removing Jeremy Corbyn. The first step was to hold a vote of no confidence in the Parliamentary Labour Party – they won that easily but Jeremy stayed put. The second step was to have a rolling series of resignations from the Shadow Cabinet and the lower Shadow Ministerial ranks. That did not work either. The gaps were either filled by bringing M.P.’s off the back benches or giving some more than one rôle. Some posts were simply left unfilled. The third step – the nuclear option – was to have another leadership election. Unlike last year the moderates would be ready – ready to challenge the Leadership in the Courts if necessary to try to increase their chances of success. The cost of being a supporter was increased from £3 to £25. 120,000 more recent recruits were barred from taking part at all after another court battle. All to no avail. Mr Corbyn increased his share of the vote from 59.5% to 61.8% and he won easily in each of the three categories of voters. The increase in Labour Party membership has been unmatched by any other party and Mr Corbyn now has a stronger grip on the leadership than before the challenge began. We will find out later today whether the Labour Party have elected a new leader. It may turn out to be one of the most significant events in determining the outcome of the next general election. Whoever wins the Labour Party seem determined to head off in an increasingly hard left direction which I suspect is not what most voters want. At the last election the view of those who were undecided whether to support Labour or the Conservatives – and as always there were many – was not ‘If only Labour would be more left-wing’. No, under Ed Miliband they were concerned it was already too left-wing. It is difficult to see how adopting a more extreme left wing agenda will help Labour win a general election – and Labour MP’s know it!